We Are Learning To create strong passwords and make our Google account secure. Every time you log in to your account make sure no one looks over your shoulder. Don't make your password too easy because people can easily hack into your account. If you log in to your account on another computer always log out of the computer. Always have a different password for each account you have. If someone already knows about you don't put too much about your identity. You could do a line from a song like Jack and Jill went up the hill. You could do only the first letters of the words like J&JwUtH. 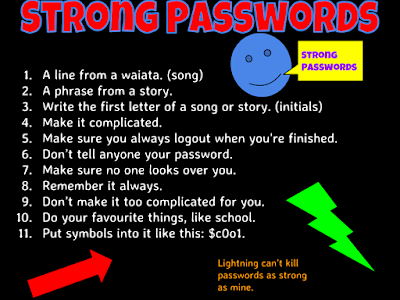 Kia ora Jack Daniel, you have shared some awesome tips for creating a secure and unique password. I like your comparison to lightening too. I really like your tips for keeping a strong password. It also reminds me of all the great tips of keeping a strong password. Do you have any more great tips? Thank You for commenting on my blog. I will try to find out new tips if I can. I’m glad this reminds you of the great tips for a strong password.